On the strength of its Galaxy phones, Samsung Electronics Co. has zoomed to the top of the list of global smart phone makers. One of the reasons that make Samsung Galaxy so impressive is that it is the right phone to enjoy video on the go. But one depressive thing is that: Samsung Galaxy only supports H.264 video and MP3, AAC audio. 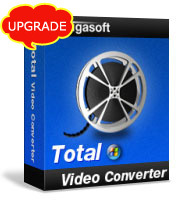 Luckily, Bigasoft Total Video Converter updated to support Samsung Galaxy. As the professional Samsung Video Converter, Bigasoft Total Video Converter can easily convert various video formats like AVI, MKV, WMV, MP4, MPG, RM, FLV, MOV, WTV, Xvid, DivX, 3GP, WebM, VP8 and more to Samsung Galaxy format. It supports all kinds of Samsung Galaxy phones including Samsung Galaxy S4/S3/S2/S/Infuse 4G/Tab/Epic 4G/Captivate/Vibrant and more. This following will introduce a step by step guide on how to play various video formats on Samsung Galaxy in two parts. 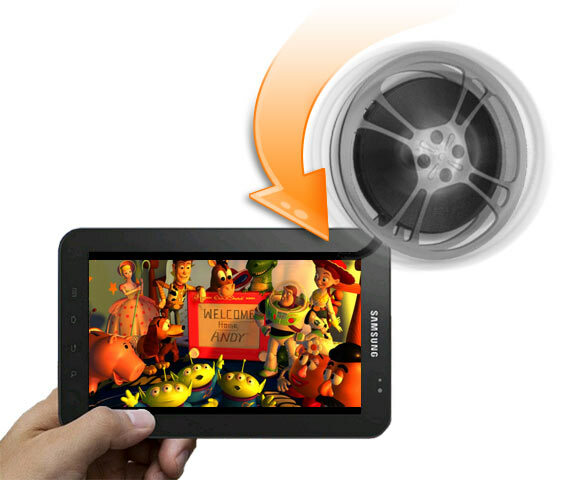 Part one: Convert any kind of video movie to Samsung/Samsung Galaxy format. Part two: Transfer the converted video to Samsung/Samsung Galaxy so as to play video on Samsung Mobile/Samsung Galaxy. 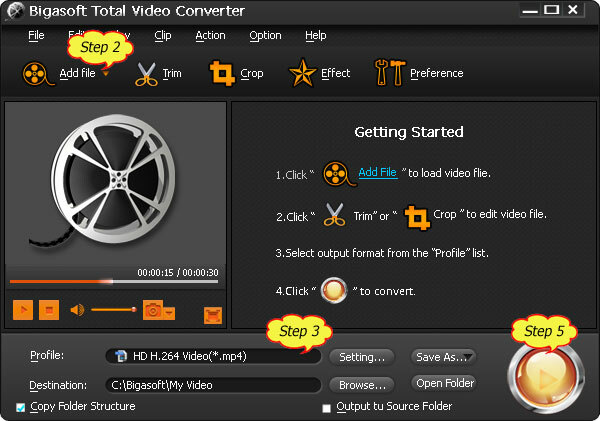 Free download Samsung Video Converter - Bigasoft Total Video Converter (Windows Version , Mac Version ) install and run it. The ideal Samsung Galaxy Video Converter is equipped with advanced editing functions to edit video. "Trim" function enables to only convert your wanted video clip by setting the start time and end time. "Crop" function helps you to cut off the black edges of the original movie video so as to watch your video in full screen on your Samsung/Samsung Galaxy. "Effect" is to set video output effect such as brightness, contrast and saturation. Moreover, it also allows trimming, cropping and watermarking video. Original preview and output preview are available. "Preference" function allows you to set output effects, image type, CPU usage and action after conversion done. You can drag and drop the folder where your video files are in to the Android Converter by checking "Copy Folder Structure" box. Click the "Start" button to finish converting video files to Samsung Mobile/Samsung Galaxy format. The converted video files will be compatible with all kinds of Samsung mobile phones and tablets including the newly released Samsung Galaxy S4. Part 2 Transfer and play the converted video on Samsung Mobile/Samsung Galaxy. This guide also applies to transferring audio to Samsung/Samsung Galaxy. Samsung Kies is key PC software that provides Samsung device users with easy data backup, data Transfer (between PC & device), powerful multimedia management, convenient purchase features and device firmware upgrade. You may directly download at here. Simply drag and drop or copy your video to memory card drive or the phone drive to realize transferring video files to Samsung Mobile/Samsung Galaxy. After transferring videos to Samsung Galaxy, unmount Samsung/Samsung Galaxy to safely remove your phone. After the above two parts, just enjoy whatever videos including AVI, MKV, WMV, RM, FLV, MOV, Xvid, DivX, 3GP, WebM, VP8 and more on your Samsung Galaxy S4, Samsung Galaxy S III, Samsung Galaxy S II, Galaxy Tab, Galaxy S, Galaxy S 4G, Samsung Vibrant, Samsung Captivate, Samsung Epic 4G, Samsung Fascinate and more!